This was a scene never seen before in France at a national act of homage: the head of government booed and called a murderer. The angry reception that Prime Minister Manuel Valls received when he observed the minute's silence in Nice is a stark warning of how the mood in the country has changed. After the Charlie Hebdo and Jewish supermarket killings in January last year, there was - if you remember - a brief moment of patriotic euphoria. L'esprit Charlie broke down political barriers. Everyone was in it together. That spirit looked somewhat frayed after the Paris attacks in November. There was criticism of President Francois Hollande for failing to act more decisively after January. But the semblance of unity held, just about. Contrast that with the atmosphere now. After Nice, the spirit of togetherness barely lasted into the following morning. Today we have all the leaders of the centre-right opposition opening fire at Francois Hollande and his supposed failings in the "war against terror". The former President, Nicolas Sarkozy, accused the incumbent of having a "hand that trembles". In an interview on Sunday, he said that "all the things that should have been done in the last 18 months were not done". His rival Alain Juppe - a man normally much more cautious than Mr Sarkozy - said pretty much the same: "If all the right steps had been taken, Nice would never have happened." Most outspoken was the former mayor of Nice. He is an ally of Mr Sarkozy. Christian Estrosi accused the government of lying over the number of police officers protecting the Bastille Day crowd and he says there were too few on duty. "The people today do not feel any sense of national unity," he told Le Point magazine. "The government can't get away with it now for the third time, with all the political forces rallying around." One thing that explains this new intemperance is the changing political context. In four months, Mr Sarkozy and Mr Juppe go head to head in the primaries of their party, The Republicans, to see who runs in next April's presidential race. Neither can afford to look soft on the Socialists, especially when on their right flank the Front National leader, Marine Le Pen, is triumphantly proclaiming her own message of "I told you so". She of course sees in the Nice attack further vindication of everything she has ever said about the government's ineffectiveness. And on the Cote d'Azur, which has a big far-right constituency, there are plenty who agree with her. The attacks on the government are therefore becoming increasingly inflammatory - if not entirely fair. To be sure, the political aftermath of the November attacks was not exactly Hollande's finest hour - what with his embarrassing failure to change the constitution so that terrorists could be stripped of nationality. The state of emergency was also arguably something of a diversion. Most tougher measures (administrative detentions, home arrests) occurred only in the first few days, and the deployment of thousands of troops has been criticised as cosmetic. Image caption Thousands of people filled the Promenade des Anglais on Monday to remember the 84 people killed there in the attack on Thursday night. But on the other hand, the government argues that it pushed through three anti-terror laws and a law on intelligence-gathering, created more than 10,000 jobs in police and the secret services, and foiled 16 terror plots in the last three years. The right is itself open to criticism over its record on security as Mr Sarkozy scrapped thousands of police jobs. And, as a general policy, attacking a government on terror is a risky ploy: does anyone really think a right-wing president would have stopped the Nice atrocity? Where the centre-right is on firmer ground is in judging the mood of the country. The attacks of last year seemed too extraordinary to provoke much more than shock and horror. 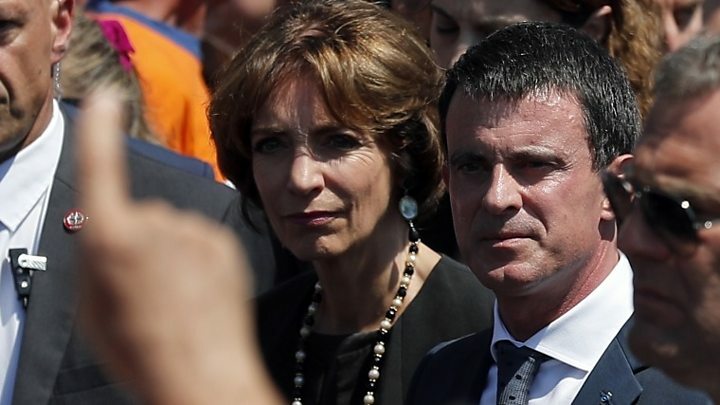 But Nice showed that mass terror is becoming regular and ordinary and - as Manuel Valls saw at the ceremony - that is beginning to make people very angry indeed.